Find the Sedona vacation rental getaway of your dreams with Latitude 8. Our exclusive first class vacation home in the jewel of Arizona’s Verde Valley, Sedona is the perfect, picturesque desert paradise you’ll not soon forget. Known for its unforgettable landscapes, gorgeous sunsets, and epic off-roading, Sedona is a unique destination unlike any other. Latitude 8’s portfolio of vacation homes in Sedona currently only features a singular property—a cozy, out-of-the way casita perfect for lovers on a getaway or a business traveler who likes to stretch out—however our inventory is growing every day. 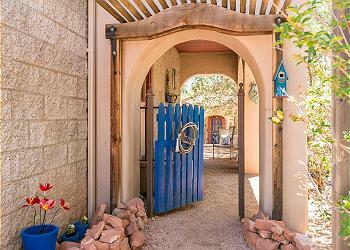 Casita Red Rock is a desert adobe cabin tucked away among the pinon pines and junipers, mere feet from the trailhead of Jack’s Canyon Trail, and views of the postcard-perfect Sedona scenery you won’t find anywhere else. Check back soon for our growing Sedona vacation home inventory. View our selection of Sedona vacation rentals below.